ROSANNA TERRACCIANO | FLAMENCO DANCE ARTIST - ¡FLAMENCO! 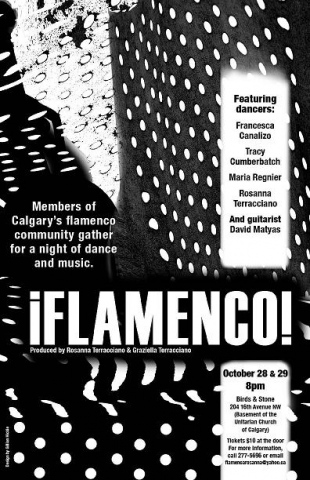 An evening of flamenco music and dance that brought together members of the Calgary flamenco community. Featuring dancers Rosanna Terracciano, Maria Regnier, Tracy Cumberbatch and Francesca Canalizo, guitarist David Matyas, and percussionist Pradeep Vyas. Produced by Graziella and Rosanna Terracciano. Poster design by Gillian Hickie.